Friday, 17th Feb. The FBM KLCI retraced for the second time this week paving some way for correction after rising since previous week. Other news to follow. "-U.S. stocks surged Thursday, with the Dow industrials less than 100 points from the 13,000 level, as the outlook for Greece’s bailout improved and American jobless claims slid to a nearly four-year low. A day after its worst session of this year, the Dow Jones Industrial Average DJIA +0.96% rose 123.13 points, or 1%, to 12,904.08, with all but one of its 30 components in the black. The gain, which put the blue-chip average back at its highest since May 2008, more than recovered Wednesday’s drop of 97.33 points, or 0.8%. The S&P 500 Index SPX +1.10% gained 14.81 points, or 1.1%, to 1,358.04, with materials and financials faring best among its 10 industry groups. All closed higher. The Nasdaq Composite Index COMP +1.51% surged 44.02 points, or 1.5%, to 2,959.85 — its highest close since December 2000 and about 40 points from 3,000." "- Asian shares fell Thursday, as investors fretted about the possibility of a messy Greek default, although Japanese shares found some support from a relatively weak yen. The Australian S&P/ASX 200 index AU:XJO -1.68% dropped 1.6%, the South Korean Kospi KR:0100 -1.38% fell 1.4%, and Hong Kong’s Hang Seng Index HK:HSI -0.41% lost 0.4%. The Shanghai Composite Index CN:000001 -0.42% also fell 0.4% and Japan’s Nikkei Stock Average JP:NIK -0.24% declined 0.2%. U.S. shares ended firmly lower on Wednesday, with minutes from the latest Federal Reserve interest-rate meeting dashing hopes for an imminent round of further quantitative easing and as uncertainty lingered over the prospects for Greece." "-Crude settled at a six-week high Thursday, supported by a combination of positive U.S. jobs and housing data, rising stocks, and a lower dollar. Other energy commodities rose to multi-month highs. Heating oil ended at its best in nine months, while gasoline finished at its highest in six months. Brent clocked in at most expensive in eight months. Natural-gas futures rallied as well, on the back of a larger-than-expected weekly decline shown in a government report. Crude for March delivery CLH2 +0.02% rose 51 cents, or 0.5%, to $102.31 a barrel on the New York Mercantile Exchange." "-US soybean futures ended lower after trading near unchanged levels for most of the day. A lack of fresh news limited trader's interest, with analysts saying the market has adequately factored in recent export sales and Brazil crop concerns on rallies in prior days. Weekly export sales near the low end of expectations, and disappointment that Wednesday's sales announcements to China didn't signify anything beyond what China were going to buy any way, triggered some profit taking, analysts say. CBOT March soybean ended down 2 3/4c to $12.58 1/4/bushel. Soy product futures ended lower, falling in line with soybeans. Light profit taking after advances in prior trading days weighed on prices, analysts say. The markets lacked fresh support to encourage traders to extend recent advances. CBOT March soymeal ended down $2.00 to $330.80/short ton, March soyoil dropped 0.30c to 53.05 cents/pound. " Stock index ended lower for the second day as most investors booked their profit ahead of coming weekend and concern over the Greece ability to contain their debt trouble. You will find that most weakness occur in the equity market are related to investors confidence and worse, fear. Greece and European financial issues have been running around since late last year and personally I just find it too common for investors to relate market weakness with this news, simply because it is not a "news" anymore. Recent market retracement are likely related more on typical profit taking activities and other adjustment when any price gone too high. If not all, most of the market information will be reflected on the price itself because no one can tell for sure why the market move as there are too many possibilities to that. 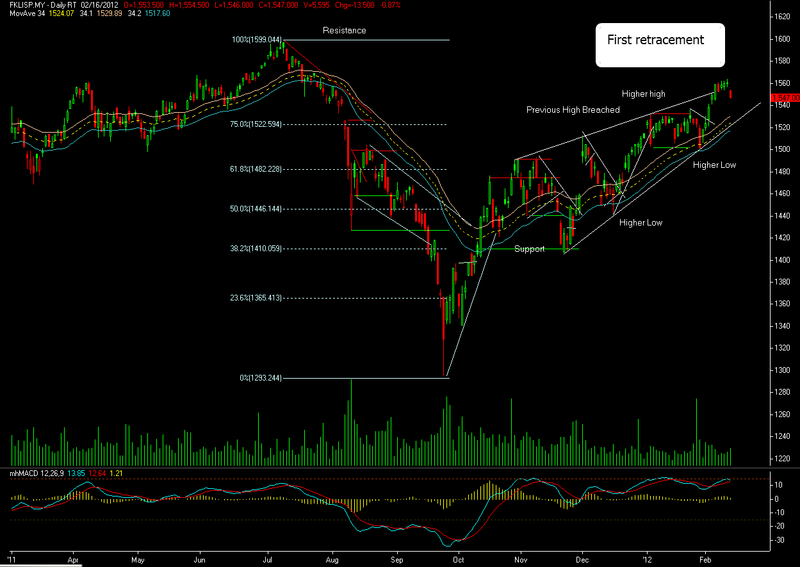 Technically, it is normal to expect series of mild corrections along most uptrend. Hence, this correction is likely turn out to be a healthy retracement unless the index futures manage to breach below the support trend line (white line shown on daily chart above). For today, support is located around 1,540 while resistance is pegged at 1,557. CPO futures might have some tough times breaching thru its previous high around 3,215 level after the new benchmark May is showing some sign of fatigue. At close, the benchmark May ended lower about RM12 to 3,189 along with Soya oil that weakened about 0.525 cents to 52.82 cents per pound at the end of Bursa Derivative session yesterday. Even though there is no swift dropped on the palm oil futures so far, price movement for the coming week is crucial to determine how well this upside could sustain or it could turn out to be another fail positive swing if it create a lower high and lower low formation. Palm oil futures price recovery might be haunted by weak demand during this first quarter plus record high stocks that still stood over two millions tons. Technically, price action remain positive judging from higher lows and higher high formation that can be seen even on daily chart. If you take a closer look there was some mild retracement occur right after Bullish engulfing candle which signifies Buyers quickly gain control over previous price weakness. 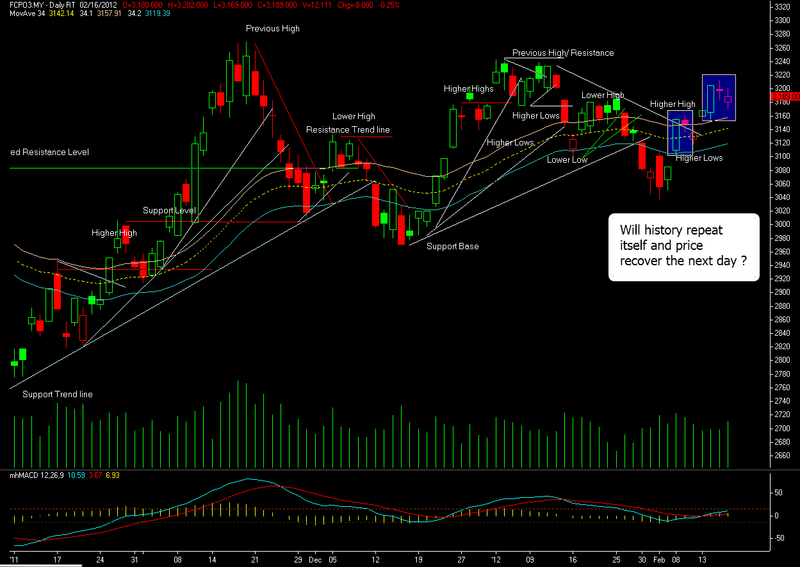 For today, support is located around 3,153 while resistance is pegged at 3,204. S2=3153Disclaimer: Information and opinions contained in this report are for educational purposes only. While the information contained herein was obtained from sources believed to be reliable, author does not guarantee its accuracy or completeness.